REAR LIVING ROOM, DUAL SLIDE OUT COUPLES UNIT. 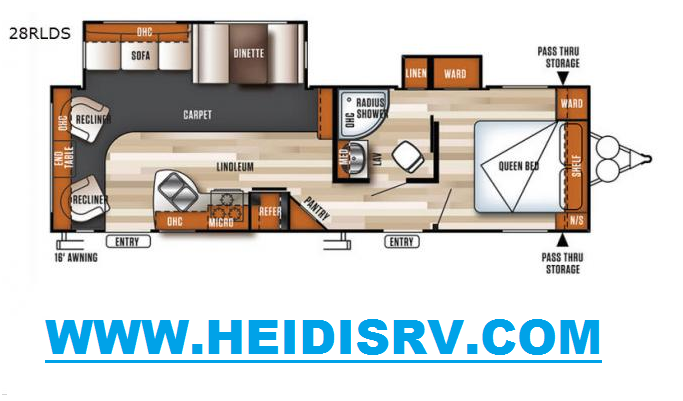 FRONT ISLAND QUEEN BED WITH WARDOBE SLIDE, FRONT BATHROOM W/ENSUITE ACCESS, CENTER DINETTE/SOFA SLIDE, CENTER KITCHEN, REAR DUAL CHAIRS IN FRONT OF LARGE PICTURE WINDOW. FULL FACTORY WARRANTY. overall length (from bumper-to-hitch): 32'3"